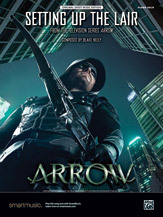 Setting Up the Lair from Arrow, the CW Network television series based on the DC Comics character Green Arrow, was written by composer Blake Neely. This Original Sheet Music Edition presents a solo piano arrangement of the tune, complete with original artwork. This title is available in SmartMusic.